What does Max DHA® do? 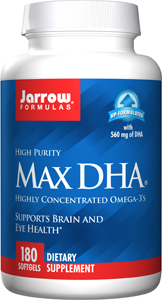 Max DHA® contains highly concentrated omega-3 fatty acids from fish oil that has been ultra purified and concentrated by molecular distillation. Max DHA® meets stringent Council for Responsible Nutrition and proposed USP monographs for purity, and is purified to remove heavy metals, such as mercury, and other environmental toxins. The predominant fatty acid in the brain, nervous system and retina of humans is DHA, an omega-3 fatty acid. * DHA is necessary for fetal and infantile neurological development during pregnancy and lactation. DHA also helps support neurological function in seniors.